Hawkins Point Lighthouse – Chesapeake Chapter U.S.L.H.S. On July 28, 1866, Congress appropriated $30,000 to construct two lights that would mark the Brewerton Channel on the south shore of the Patapsco River approaching Baltimore Harbor. The rear light, Leading Point, was built on a high bluff of land approximately one mile from the front light, Hawkins Point, built on a shoal in six feet of water. When ships were on true course coming or going through the channel, the three lights from the two lighthouses could be seen in line, one above the other, and guide them through the channel safely. 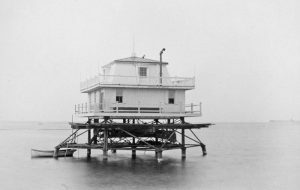 Hawkins Point Lighthouse was a rectangular screwpile structure with wooden piles and iron sleeves with a thirty-four-foot square tower built on top. It was fitted with two lights. One light was on top of the wooden tower with a 70-foot focal plane while the second light was located inside the building’s top floor with a 28-foot focal plane. Both lights were exhibited for the first time on November 1, 1868. Hawkins Point Lighthouse became the center of a dispute in 1885 when landowner Thomas C. Chappell claimed that he owned the land where the lighthouse stood. He also claimed that the lighthouse interfered with use of his property and wanted it removed, as he wanted to construct additional buildings and wharves. The U.S. Lighthouse Board attempted to purchase the property, but he wanted an outrageous price. In 1887, the U.S. Government filed a petition for “condemnation” in Maryland Circuit Court and the case was eventually moved to the United States Circuit Court after Chappell filed a lawsuit against the keeper at that time, James M. Waterworth in 1889. After multiple appeals from mariners to the Lighthouse Board, measures were taken to purchase the land in question so that the lights would not be obstructed. The judge ordered the owner of the land to receive $3,500. He was obviously not happy with the decision, as Chappell continued filing appeals over the next few years, with the last appeal in 1914. In 1913, the lighthouse sustained damage when the Alum Chine, a freighter loaded with dynamite, exploded and sank in twelve feet of water not far from the lighthouse. In April 1915, the light is changed from a fixed white light to an automatic flashing light, flashing every second. On April 16, William Raabe, Hed Keeper at the Leading Point Lighthouse, became keepers of both lighthouses and the lights officially became known as the Brewerton Channel Front and Rear Range lights. In 1924, the lighthouse is demolished, and an automatic light is installed on the remaining screwpile foundation. By 2015, the light on the old screwpile foundation is removed and a new light consisting of solar panels is built in the river to serve as the front light of Brewerton Range. Assistant Keepers: T. B. Williams (1868 – 1869), Theodore Hamlin (1869), Ross Johnson (1869 – 1870), William R. Brown (1870), John Freeman (1870), Andrew J. Flemming (1870 – 1871), Hellen Isabella Waterworth (1871 – at least 1875), Thomas J. Waterworth (1876 – 1877), James M. Waterworth (1877 – 1882).